Often spouses who are already desperate to find the desired child, decide to seek help for the Lord and his saints. If people never went to Church and participate in Church life, they face many questions: Whom to pray for the birth of children? Before any icons to do this better? Christ asked the blind men who asked Him to leave them blind: "According to your faith be it unto you." These words show us that the most important thing in prayer before any icon is sincere belief. There are many different prayers for the gift of children: the Lord's prayer to God, the blessed virgin, the prayers of Matrona of Moscow and Xenia of St. Petersburg, Sergius of Radonezh, prayers in front of various icons of the virgin. Pray about the pregnancy and you can own simple words, most importantly, turn to the Lord and the Holy faith that your request will be heard. About pregnancy you can pray to any icon of the blessed virgin. It is believed that especially help in the conception of child icons "Fedorovskaya", "Healer", "Merciful", "nursing the child". Icon "the Healer" comes from Georgia. In Moscow, the miraculous image of the icon is in the Church of the Resurrection in Sokolniki. The miraculous icon of the "Merciful" is in the conception monastery in Moscow. There are special prayers before these icons, but you can pray in your own words, if the texts of the prayers for you are not very clear. Better if you pray for the birth of the baby before the icons will be both spouses. But if your husband does not believe in God's help and does not want to go to Church, do not despair, this does not mean that the Lord will not hear your prayers. 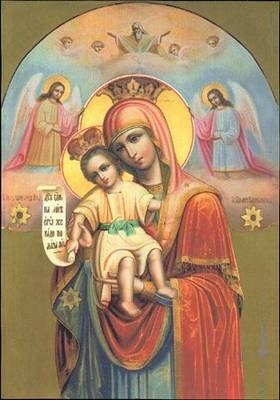 In the prayers before the icons mention also your spouse, ask the Lord to forsake him and helped to gain him faith. If you are particularly close to a certain Saint, for example, Matrona of Moscow or Saint Nicholas, you can pray before their icons. You can also read the akathist to this Saint. The akathist is a kind of praise prayer, which describes the whole life and miracles of the Saint. Before any prayer places not to go to Church to confession, clean your soul from sins, accumulated over years of life. After all, the bodily disease is the manifestation of spiritual disease. Very often with lifestyle changes, a person with the appearance in his life the spiritual component, the ailments disappear. Inability to conceive can be attributed to spiritual ailments, so the Lord shows families what they need in their life to change things and to change ourselves. If you never took communion, do it. The communion is the most important Church sacrament, in which we symbolically in the form of bread and wine partake of the body and blood of Christ, thereby become involved in the life eternal. Communion cleanses our soul, this kind of "medicine" for the soul. If you've decided to ask God about the birth of children neglect of Church ordinances. Communion is not some magical ritual, by taking communion, we remember the last Supper, when Christ distributed to his disciples bread and wine with the words "this is My body which is broken for you: this do in remembrance of me." Do not hesitate to ask for advice to the priest. If you came to Church for the first time, ask a priest to tell you how to properly confess, is how to prepare for communion, what prayers to read at home.